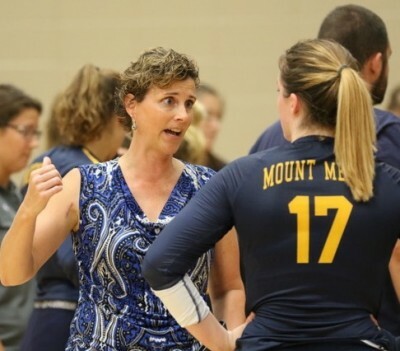 The Mount Mercy women's volleyball team let an opportunity for a conference victory slip away Tuesday night. The Mustangs lost to William Penn, 20-25, 25-15, 27-25, 25-19, in a Heart of American Conference match at the Hennessey Recreation Center. Mount Mercy had a 25-24 lead in the third set and needed just one more point to take a 2-1 lead in the match, but the Lady Statesmen rolled off three straight points to grab the third set for themselves in overtime, 27-25. William Penn took a pair of eight-point leads in the fourth set and sealed the victory from there. The outcome left both teams with 1-1 records in the conference. Mount Mercy fell to 11-3 overall. William Penn raised its mark to 10-4. Maddie Bell and Olivia Coe had 11 kills for the Mustangs. Becca Thomson had nine kills and Olivia Makinen had six. Kayla Daggett finished with 43 assists for Mount Mercy. Lauren Stopko had 33 digs. Caiti Peterson provided 19 digs, Thomson 15 and Alyssa Weldon 13. Bell finished with eight blocks and Coe had five.